The tech and venture corners of the universe are large and rising. There are more people in the business and more people interested in the business than usual. Perhaps more than at any other time, there is huge general and insider attention. As much as tech’s ranks have grown, the space remains unusually insular and inwardly focused. The larger a sector grows, the greater its influence, the more the macro context merits attention. Outside the walls of the tech subculture, folks are increasingly nervous about the direction of asset prices. This is particularly true regarding the price trend in risky assets. Risk assets like tech investments. The world hangs on meeting notes, phrasing and prognostication regarding long-anticipated interest-rate normalization by central banks. The vast preponderance of opinion suggests that rates are about to move back toward normal ranges from the record-breaking lows held for so long. In 2008, interest rates were cut to never-before lows and have been kept there ever since. The Federal Reserve, the European Central Bank, Bank of England, Bank of China and Bank of Japan all jumped into local and global stimulus. 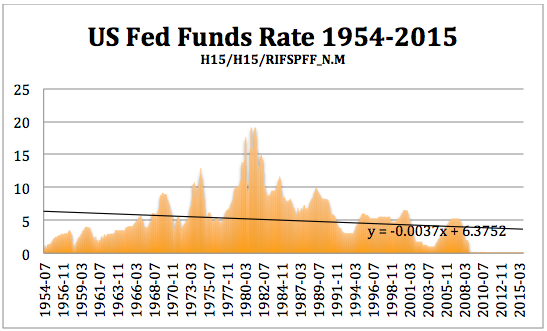 Over the last 60 years, the average Fed Funds rate was 5 percent; today, the Fed Funds rate is around .25 percent. Interest rates in the U.S. have been set and kept lower longer than anyone forecast or might have reasonably expected. Thus, we have rates at 1/20th the long-run average level since the Korean War era. We have been waiting for this to normalize, and this debate and waiting game has buffeted markets and asset prices. Very low rates push investors to take risk to get returns. Risk assets have benefitted greatly. Illiquid assets also have gained as the cost of money is set and kept at very low rates. Pre-IPO technology firms have benefited in three ways. First, the push into risk assets helps draw allocation to this class of risk assets. Secondly, the very low rate of interest reduces the cost to tying up monies over the large number of years that come between starting a firm and getting liquidity. Thirdly, low rates fuel speculative share buying that raises the multiples applied to valuing to private companies based on public companies. Interest-rate policy has herded investors to take greater risk. When safe investments guarantee returns less than the inflation rate, you are assured of losing wealth deployed to low-risk assets. Central banks do this to force investors to take risk in hope of restarting the economy and growing out of the debt overhangs and shaken confidences that downturns produce. Interest-rate policy has herded investors to take greater risk. Low interest rates push away from traditional savings; monies pooled in savings and safe assets actually lose money in inflation adjusted terms. Where does this wealth go? Billions upon billions have gone to venture investing. Millions and millions of dollars go to angel investing. Monies are borrowed and used to buy shares, public and private. Low rates and loose monetary policy balloon the quantity of funds to borrow and reduce the costs of borrowing. This is the under-factored link between interest rates and technology valuations. You are likely not used to discussing or pondering the relationship between interest rates and rate policy and appetite for tech investment. Tech-land has settled into a feast and famine pattern, and usually maintains its sense of exceptionalism during booms. When booms end, there is general disbelief — and sometimes a search for external causes of turbulence. We have been doing the unthinkable, or maybe just the less commonly thought. We have been asking, why don’t folks see tech investments as another class of illiquid, risk assets? We decided to look — and share a bit of what we found. A look back at the Fed Funds rate and the number of venture deals shows that low rates have positive correlation with good numbers of venture-backed IPOs. Low rates and falling rates are positive and high, and rising rates have negative correlation. We sit at the end of the longest period of the lowest rates. This long period of low rates has coincided with an unusually strong venture and tech run. Likewise, the duration of ultra low rates is uncommonly long, at six years and counting. 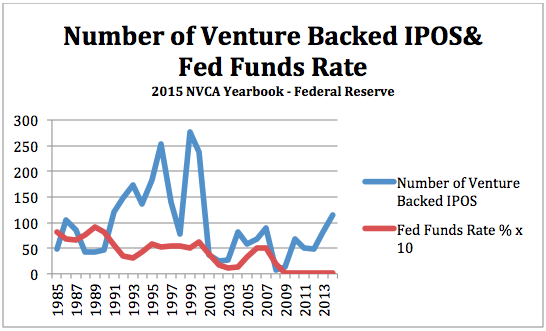 We looked at the venture-backed IPO count and the Fed Funds rate, an interest rate set by the Federal Reserve. We scaled up the Fed Funds rate by 10x to allow easy comparison on the same graph as the number of venture-backed IPOs. Clearly, low rates and high IPO flow are fellow travelers. Additionally, higher interest rates and lower rates of venture-backed companies going public are also fellow travelers. We expect a slow and less than dramatic rise in interest rates. We will likely see a cautious Fed slowly step up rates in .25 or .50 percent increments. These gentle steps and less than robust global and national macroeconomic environments suggest that rates will normalize slowly and partially. There has been a general drift toward lower rates over time. We don’t see this reversing. Whatever benefits tech and venture have gotten, and clearly there have been benefits, will slowly be withdrawn over the coming quarters. However, we do see rates rising short-term intermediate term and longer term. Low risk assets will cost less to investors and borrowed monies will cost more and be a bit harder to come by. All this is to say, tech is big and integrated; thus, it is a macro story and will be deeply influenced by macro development. There is nothing more macro than central bank policy and interest rates. Interest rates should rate greater interest in tech-land.